The next free DLC pack for Pillars of Eternity II: Deadfire. 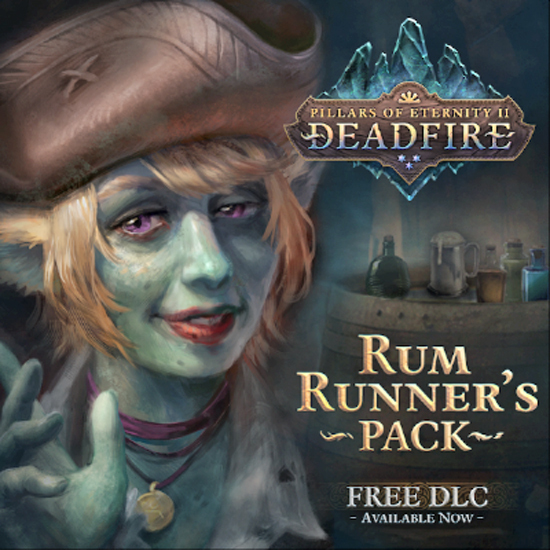 The free DLC, titled ‘Rum Runner’s Pack’ is among several free DLC packs which are planned to add more content to the game over the coming months. The development team is also hard at work on updating Pillars II with the next update bringing a host of improvements and features, like the ability to change the player character’s appearance at any time, which will be released alongside the next free DLC, the Beard and Hair Pack, early next month. RUM RUNNER’S PACK FREE DLC – WHAT’S INSIDE? In addition to the latest Rum Runner’s Pack free DLC, Pillars of Eternity II: Deadfire players are also reminded they can also pick up the free Critical Role Pack DLC on Steam. Based on the top live streamed tabletop campaign, the pack includes special portraits and player voice lines that can be used for custom created characters based on the members of Vox Machina, the characters from the first Critical Role campaign.